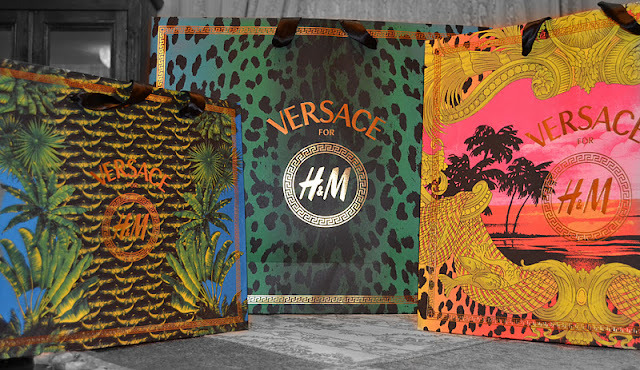 Ed ecco cosa ho comprato della Capsule Collection "Versace per H&M". This is what a bought for the "Versace for H&M" Capsule Collection. Dopo aver visto Anteprime Esclusive, le foto Ufficiali della Campagna Pubblicitaria e il Fashion Show di New York, finalmente il 17 Novembre la collezione è sbarcata in tutti gli Stores Selezionati. Per fortuna (solo in questi casi) la mia città non è molto "Fashion", non ho dovuto fare code interminabili o dormire tutta la notte fuori, addirittura avevo il turno delle 9.50 ma appena hanno aperto (i ragazzi eravamo pochi) ci hanno fatto entrare tutti insieme senza limiti di tempo. Sinceramente se avessi dovuto fare la fila come ho visto in città come Milano o Roma non sarei nemmeno sceso di casa. After seeing Exclusive Preview, the photos of the Official Ad Campaign and the Fashion Show in New York City, last November 17 the collection landed in all the Selected Stores. Fortunately (in these cases only) my town is not very "Fashion", I have not had to do endless queues or sleeping through the night outside, even had the round of 9:50am, but as soon as they open (the boys were a few) we just went inside the Versace space at 09.00am. Honestly if I had to queue as I've seen in cities like Milan or Rome i would not even got outside my bed. Devo ammettere che sono rimasto veramente meravigliato dalla qualità dei capi e soprattutto del materiale utilizzato che è decisamente molto lontano da ciò che utilizza solitamente la catena svedese e questo si può evincere anche dai prezzi stessi. I capi che ho scelto sono molto particolari ma non avendo molte stampe nel mio armadio finalmente ho arricchito questo aspetto mancante. I must admit that I was really surprised by the quality of items and especially the material that is very far from what normally the Swedish low Cost brand use and this can be seen even from the prices. 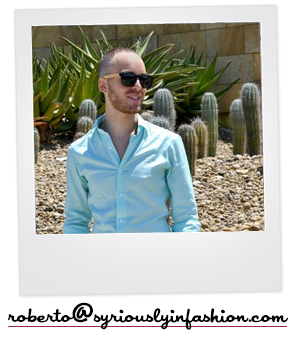 The items that I have chosen are very special but i have not a lot of prints in my closet and I finally enriched with this items this aspect of my closet. Per iniziare ho preso questa T-shirt tutta leopardata azzurra con un tocco di verde con stampa centrale. 100% Cotone. 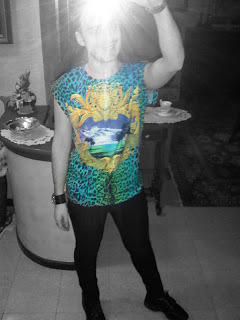 To start, I got this Leopardskin T-shirt blue with a touch of green with central print. 100% Cotton. Il Bomberino molto semplice, tutto nero con soltanto le maniche con stampe. Tessuto esterno 100% Cotone. Imbottitura 100% Poliestere e Fodera 100% Viscosa. This very easy to wear Backet, total Black with only the sleeves with prints. Shell 100% Cottone, Padding 100% Polyester and Lining 100% Viscose. Il Maglioncino con tutte le Palme stampate. 85% Lana Merino - 15% Kashmir. The Jumper with all Palm printed. 85% Merino wool - 15% Cashmere. Per finire non ho resistito nel comprare il pezzo più bello della collezione. Il chiodo in pelle con le greche borchiate e zip dorata laterale e nelle maniche. Non potete avere idea da quanto tempo cercavo un bel chiodo in pelle con borchie e questo, con le greche, mi ha veramente conquistato immediatamente sia per il Design che per l'ottima qualità del pellame. Tessuto esterno 100% Cuoio. Imbottitura 100% Poliuretano e Fodera 100% Viscosa. At the end, I could not resist buying the most beautiful piece of the collection. The studded leather Jacket with Greek and golden zip on the side and in the sleeves. You can not have any idea how long I wanted a nice leather studded Jacket and wit this oneit was really love at first sight for two reason: Design and High Quality. Shell 100% Leather, Padding 100% Polyurethane and Lining 100% Viscose. Tutti pezzi che abbinati come abbiamo visto nelle foto Ufficiali della Campagna non rendono molto ma mixati in modo semplice con il resto del proprio armadio riescono a dare un tocco allegro e di colore spezzando cosi i soliti e tristi colori invernali. All pieces that matched as we have seen in the photos of the Ad Campaign really look not very easy to wear but if you can mix them with the rest of your wardrobe, they can give a touch of happyness and they can break the usually pretty sad winter colors. Che ne pensate? Voi cosa avete comprato? Presto indosserò anche gli altri capi, per vedere come li riuscirò a mixare seguitemi su Facebook..
What do you think about my choice? What did you buy? Soon i will wear the other pieces, to see how i can mix them just follow me on Facebook. lucky you for having it IN YOUR TOWN!! + that amazing leather jacket! Oh, wow...great stuff!Love the leather jacket! Those jackets are fabulous! Especially the leather one is the best piece! Great purchases!!! io ho preso la borsetta borchiata! Bellissimo il bomberino, mi piace un sacco! You bought so many thnigs! Enjoy your purchases! They look good on you! il chiodo mi piace molto,è uno dei capi migliori! molto carina la t-shirt e il maglione....non male come shopping! fantastic the leather jacket ! great buys! i esp love the leather jacket! Wow, you are lucky - great pieces. Bravo per questo schiaffo che hai dato a tutti quelli che hanno criticato la collezione. Ti invidio due pezzi: il maglione e la giacca borchiata. Io ho preso i foulard (che userò come fazzoletti da taschino), le magliette (tranne la tua perché era troppo larga, non mi piaceva come cadeva su di me! ), poi la cintura borchiata (vera pelle e made in italy!!!) e il foulard rosa della collezione donna x mia madre! ;) Ma gli scarponcini che ti piacevano tanto???? ?Non li hai presi? 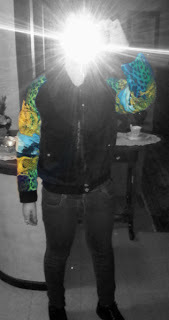 :((( La giacca ti ripeto, è splendida! i love everything!! you look amazing that last leather jacket is insane! The quality is really great but i don't think many would like the design. The women's designs are really nice but for men..??? i'm not that convince at all. 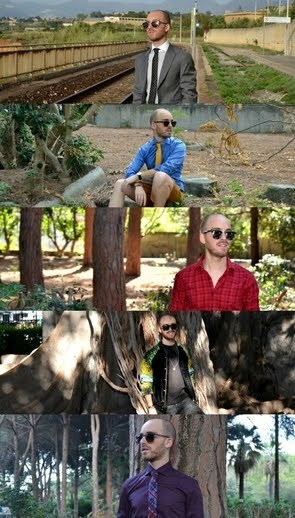 Not very versatile, really limited on styling garments. After vowing that I would not line up or that matter buy anything, I went later on in the day and managed to get the same T-shirt as you and the black shorts. Like you I was also surprised with the quality. Il Giubbottino è veramente fantastico!! La maglietta ti sta benissimo giù testata nella nostra serata ;) Bei pezzi, mi piace l' originalità dei capi. Love the leather jacket !!! Wow! La maglietta è divina! i think Versace for H&M is pretty cool and most of all..these are items that everyone can not wear because they are quite particular.you must love Prints. per le ragazze non c'era nemmeno molta confusione e al momento dell'entrata nella zona Versace non facevano molta fretta come in altre grandi città che davvero avevi 10 minuti contati. @anonymous ci sono modi e modi di esprimere i "consigli" il tuo era un pò offensivo ma come vedi non ho rimosso nulla. che poi scusami proprio la parola "normale" è una delle parole più stupide che esistano. magari per te è normale giacca e cravatta per me è "normale" una t-shirt leopardata come questa. Madonna First Fragrance "Truth or Dare"